Maryland is a great state for solar energy, considering that the local government has been supportive of alternative energy for quite a while. Getting your electricity from the sun is a smart move, considering that utility rates in the state are above the national average. In other words, installing solar panels on your house will save you cold, hard cash. Maryland solar installers are waiting and eager to help you become more energy independent and improve your financial outlook. With the Renewable Portfolio Standard (RPS) utility providers are being encouraged to support residents who want to generate electricity using solar panels. Through RPS, utility companies must give you as a consumer certain benefits for using renewable energy. As a result of the program, the cost of solar energy systems in the state of Maryland is going down, which is a wonderful incentive to jump in and go solar now. 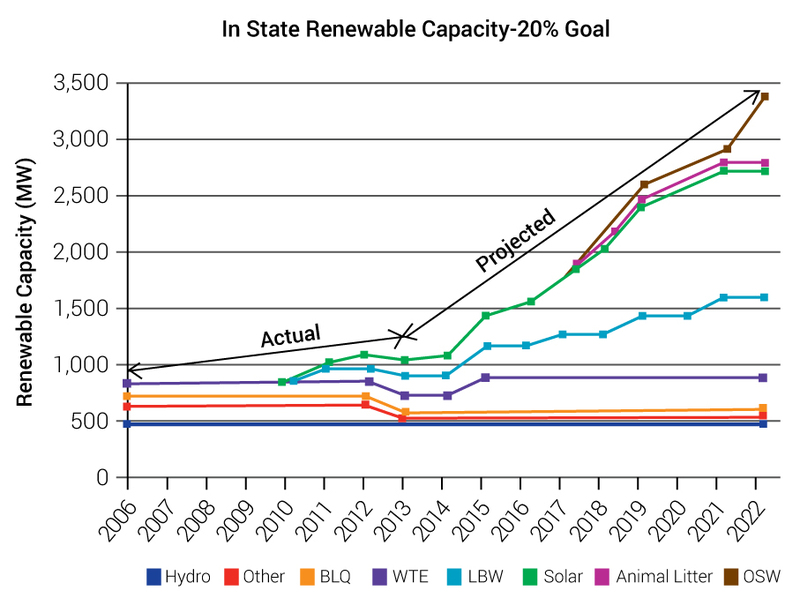 Chart source: maryland.gov Under RPS, Maryland is looking to convert 20 percent of its in-state energy to renewable sources by 2022 (see chart above). Because of the program, quite a few people are taking up the offer and using more renewable energy. 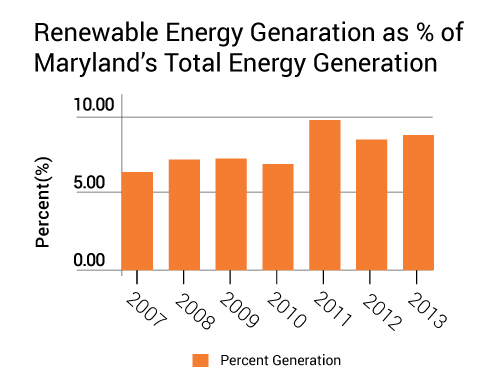 In fact, according to the state Maryland is eighth in the U.S. for solar energy generation. The good news is that the government is planning to increase the number of people using solar power by a huge amount in the coming years, and it plans to do that by throwing a huge list of great incentives your way. Electricity is expensive in Maryland. Around the United States the average price for a kilowatt/Hr of electricity is about $0.13, in Maryland it’s about $0.1374. With money tight for so many residents, it shouldn’t be a surprise that people are clamoring for a way to cut down on their electricity bill, including going with a solar system for their house. It’s human nature to want to save up big wads of cash. After all, with extra money you could pay off any debts you might have, save up for a relaxing retirement, or get to other financial goals a lot sooner. If you own a house in Maryland, you can realize your dreams so much sooner by taking advantage of the savings that come from going green and installing a solar power system. Thanks to the high cost of electricity, which is only going up, using renewable energy will save you even more money in the future. 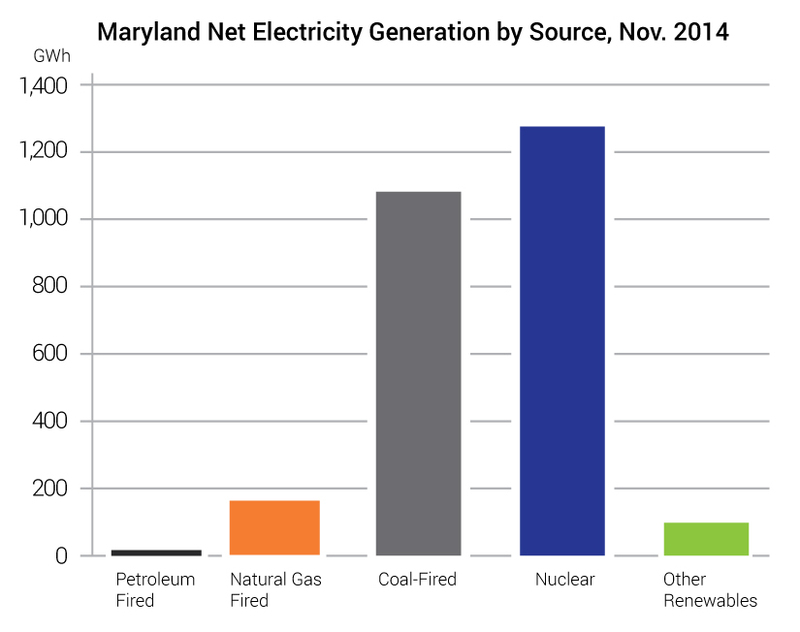 The chart below shows Maryland’s net electricity generation by source. It is quite clear that renewable energy has ways to go before it can fully replace conventional sources, but the state of Maryland definitely helps homeowners to switch to solar energy. It will take more time and continuing government help to make solar viable option for energy, but the wheels are definitely in motion. Talk to one of our highly qualified professional solar installers today and learn more about just how much money you can save each month. Too many people don’t buy a solar PV system for their home because they mistakenly believe they must have the money to pay for it upfront. The thing is that leasing a PV system can actually make it so you save more money than if you bought the system with cash at the beginning. That means not leasing a system gives you a worse return on your investment. So take advantage of the fact that with zero money down you can get a system for your house, making it an affordable and easy way to start saving money. The savings from financing a solar system might not always come immediately. Over time, the savings stack up, making it a wise investment you’ll be glad you made. There are cases of a financed residential system that pays for itself from the first day, which is easy to see as a solid investment. The rate on your system’s loan is fixed, but the cost of electricity isn’t. With a solar panel setup, homeowners can save 50% to 100% on their electric bill when compared to a traditional setup. This depends on the specific details of the system. As prices climb from rate increases in Maryland, the interest you pay on the solar panels becomes a better deal. Considering how quickly electricity prices are rising, it won’t take too long for your loan’s fixed interest rate to be surpassed by the frequent utility rate increases in Maryland. According to the Maryland Clean Energy Center, a residential solar system cost around $12 per watt to be installed. When the entire solution is installed, which includes the panels, plus a power inverter and labor, most people are looking at about $20,000 to $50,000. In one case cited by The Baltimore Sun, a couple with an historic Victorian home was able to install their system for about $30,000. While that might sound like a lot of cash, all of the incentives and rebates add up quickly. You’ll also be saving big time on your energy bill, making a solar system a solid investment. To get an accurate solar quote for your situation, leave your details and a professional installer will get in touch with you. Nobody likes how much they have to pay out each month to the utilities company. Instead of just complaining about your bill, do something about it! Talk to a professional solar system installer and get the ball rolling on creating your own electricity at home. Remember that having a solar system on your house means you pay less each month for utilities. The really great thing is that Maryland provides other benefits to anyone who goes solar, helping you save even more money by going green. Anyone who’s a resident of Maryland can use the Home Performance Rebate program. Itrewards homeowners with rebates for improvements that affect a house’s efficiency. The rebate’s good for 35% of the system’s cost, up to $3,100 total, thanks to the Maryland Energy Administration. The utility company also gives out a 15% rebate under the program. That means you stand to save up to half on your solar power system. It’s a big incentive to push you toward energy independence, while also benefiting the environment. The State of Maryland really wants to help people who purchase a solar system for their house benefit from that decision. That’s why it offers a Clean Energy Production Tax Credit, which gives you a break on your state income tax. When your residential system produces more than 20 kW, you get a tax credit of $0.85 per kWh. You can claim the credits for a five year period. The program closes down on January 1, 2016, meaning you need to get a move on it to use it before it’s gone. Through the federal government you can get another tax credit. Thanks to the Residential Renewable Energy Tax Credit, homeowners can claim a credit of 30% for all qualified expenditures involved with installing the system. This means you get two tax credits on top of each, multiplying your reasons to go solar! Thankfully the Maryland state legislature had the foresight to give homeowners a property tax exemption for their solar panels. When you have a solar system installed, you don’t have to pay property taxes on that improvement. Usually, when you install something on your home that adds the kind of value a solar system does, you have to pay the state in taxes, so this is a great deal! The savings doesn’t stop there! By installing solar panels on your home, you also earn a sales tax exemption. You can’t remodel your kitchen or add a new garage and skip out on sales tax, so this is a truly unique advantage. What this means for you is more cash savings, making the system that much wiser of an investment. Maryland residents who install a solar system at their residence can also qualify for a cash reward. The system must have a capacity range of somewhere between 1 and 20 kW to be considered. The amount of money they can be given through the incentive is $1,000, helping cushion the cost of going solar even more. Is it worth investing in residential solar energy in Maryland? Many Maryland residents wonder if getting a residential solar energy system is a good deal or not. That fact is that not everyone’s situation is the same, but a solar system is almost always a great investment. Some people see money coming in immediately from their solar panels. By talking to one of our solar installers you can get a firm grasp on what you stand to gain in your exact situation. Normally solar lease for a house is for about 20 years. Doing this might mean you don’t qualify for certain tax credits, rebates, or incentives that are reserved for people who buy their system. You also can’t depreciate the cost of the system for your taxes each year. Before you think buying a system is better, know that there are still some real advantages to financing a system. Depending on your unique utility situation, you could save as much as half of what you’re currently spending each month on your bill, putting more money in your pocket. Remember that some lease agreements mean you don’t even have to maintain the solar panels, which can be a real benefit. Really, one of the biggest advantages to leasing a system instead of buying one is that you might even be able to get into it for 0 money down. At the end of your lease, you also can decide if you want to buy the panels. Usually you need excellent credit to qualify for a lease. You have a lot of reasons to install a solar PV system for your home. Adding to the list is the Maryland Home Energy Loan Program, which helps make financing the setup more affordable. Through the program, homeowners can get a loan for up to $20,000 with an interest rate of just 9.99%. The program is designed to help people get over the up-front costs of installing a solar system. Can I lease the system in Maryland? Should I buy instead? There are a lot of factors that can make buying versus leasing solar power in the state of Maryland a better deal. Because of the complex nature of the decision, the best thing is to speak with one of our solar installers, who can provide a professional assessment. 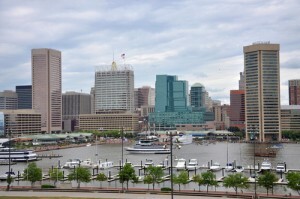 What about Maryland Net Metering? 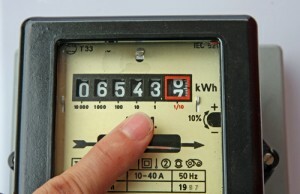 Through Net Energy Metering, homeowners save money on their energy bill. You actually sell a portion of the electricity your solar panels make to the utility company, which buys the energy off of you. Of course, your home must be connected to the grid if you want to exercise this option, plus there are some other requirements you must meet, which the utility company specifies. The credit homeowners you get from selling off the electricity can be applied to your bill, helping shrink it and putting more money in your pocket. Depending on just how much electricity your solar panels produce, you might owe little on your bill. In fact, it’s possible you could get paid by the utility provider, instead of the other way around. Anyone living in Maryland who’s even just a little curious about solar power should find out more now. This is a great time to invest in renewable energy, because there are some great incentives that could help you save a lot of money. You might even find that the utility company owes you, making a solar system totally worth the investment. Remember that installing solar panels on your house is a great investment. Also, by relying less on electricity created by burning fossil fuels, you’re helping cut down on pollution. Solar panels give off no emissions and doesn’t involve damming a river and destroying a habitat for countless animals. In fact, solar panels are up and out of the way, making them a great way to produce clean energy. Find out just how much your solar power system will cost in your unique situation, plus get more details on how to have a system installed for your house here.